Christmas cards, QVC and a little helper! Yaaay, David managed to find the lost photos that I thought had gone up in a puff of smoke! There were lots of them, but here are just a few to give you a taste of what the workshops are like and a couple of cards that I did for the demonstration. This is a simple card enhanced by the lovely MS punch around the page set "Snow Flurry", one of the new "Holiday" punch sets for this season. I used American Crafts red textured card and my "Christmas Collage" unmounted rubber stamp PIRS027. This one's great for fans of colouring in! As I do a lot of inky, distressy cards, I am enjoying doing some clean, more straightforward ones as a change. Here's a card using my Angelic trees stamp set PICSA6259, where I used a photocopied Bible page of the birth of Christ as the background with some Ranger acrylic dabbers smudged over it. The Peace on Earth sentiment is from Andy Skinner's "Let the Festivities Begin" stamp set. The Minarets are from my Nativity set PICSA6258. We were using this set for one of the cards on last Sunday's workshop....here is one card being layered up after alcohol inking the background and stamping the trees, Minarets and stable scene. Hard at work cutting out trees for our snowy scene card..... ......even a bandaged up hand didn't get in the way of this beautifully stamped and coloured card! Here am I just overseeing things and reminding some of the ladies what effect they were going for....though, as you can see, they were pretty much concentrating on what they were doing! A great time was had by all and if you do fancy joining in the fun of my workshops, I now have more details of what we'll be doing at each one. Please email me for more details, or to book, or call in to Crafts 4 U 2 Do, St Helens, where they'll be happy to help you. We have also added an extra weekday date into the schedule on Thursday 22nd September and this will be held at the shop itself - this workshop will be for fewer numbers, so do book early if you'd like to attend. 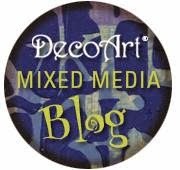 10am-12.30pm: Artsy cards and tag: Christmas themed with inky techniques. 1.30pm-4pm: Christmas Shadow box: create a wonderful festive gift or keepsake. Cost for the above is £30 for the full day of workshops. 1.30pm-4pm: Christmas decorations: We'll be making a selection of tree decorations using various materials and techniques. Hope something tickles your fancy from the list there! Finally, another stamp set has been added to my new Christmas designs. 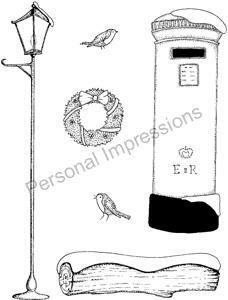 It is called Christmas Post PICSA6266 and features the Postbox, lamp post, wreath, yule log and two teeny robins. It works really well with the Build a Snowy Scene set. Hope you like it! Well, a cup of coffee has my name on it now and then I'll be back to do another post about the last week at QVC and in Yorkshire! Love the post box, it looks so good on the cards. I had a ball at the workshop and maybe one day will be invited to the QVC event - she says!!!! Going to see whether our Susi might like some fun at one of your workshops. Hi there I am the lady who did my own thing with the owl stam and log. Had a lovley day and your stamps are lovely!